Many people with incomplete spinal injuries can improve significantly with certain number (enough) hours / weeks / months of programmed and correct walking exercises. with use of high rolling walker (cart) and with help of hard knee braces. I have also witnessed so many people with incomplete injuries who made a difference and successfully recovered to any form of independent walking. They were usually exposed to some kind of “torture” of certain amount of repetition, hours, days, months and even years of very hard walking exercises. They were passing through pain and spasm barriers to achieve better mobility. It is well known that Brain and Spinal cord have great Plasticity – or ability to “re-wire”and start to use available pathways and resources even when dedicated neural pathways are broken. For this purpose One need to be re-trained with certain amount of correct repetitions. If there is no enough repetitions, not enough walking, not correct techniques, less chance to make it. Gait training is the most known and popular training @ Western rehab centres where person is helped with certain harness system to remove completely or partialy power of gravity force from patient body and helping patient to move a legs manually, with robot machine (Lokomat) or using electrical stym signals to leg muscles (Parastep). After numerous of repetitions and depending on individual situation and effort in the lot of cases patient improve to the next level. In some other centres patients are actually exposed to the very basic crawling exercises. This is particulary useful for people with bad balance and bad core muscles control . Swimming pool / water exercises helps to remove chance of injury and with grade / incline ramp gradually train body to accept gravity. Recently, Dr. 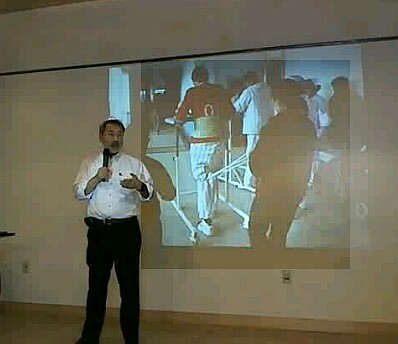 Wise Young has provided detailed explanation about Chinese experiance with walking training where in Military Hospital in Kunming people are exposed to extreme walking exercises 6:6:6 (6 hours per day / 6 days per week / 6 months) and techniques of “pulling rope to lock a knee walking”. 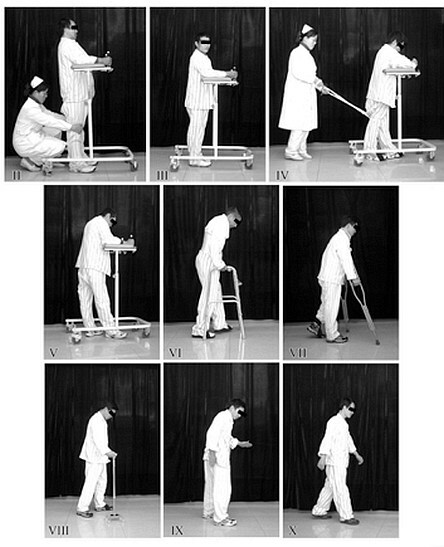 where patient is using high rolling walker / cart usually supported core / lower back muscles with high, tight leather belt and with no hard knee braces. Knee locking to support body weight is secured with person that’s helping from behind to pull ropes (usually made out of sheets) and releasing only one side to enable patient to make a step with supporting weight on a leg with locked knee (with tight rope). In Kunming, they use this rolling cart, no bracing, no weight support harness, and only two elastic ankle bands to prevent foot drop. They believe that use of weight support harnesses is not good and that braces impede locomotor recovery. They eschew weight-bearing harnesses because most harnesses focus pressure on relatively small patches of skin, often around the pelvis and between the legs. The risk of developing pressures sores is high if a person walks in a weight-supporting harness for 6 hours a day. The subjects in Kunming have been walking as much as 6 hours a day, using a rolling cart upon which they could rest some of their weight, shown in the attached picture. I have described this walking procedure many times both on carecure as well as many open houses. Each subject progresses throught the various stages in sequence. In the beginning, all of them just stood with somebody holding their knees. Then many began to stand on their own and started taking steps while leaning on the rolling cart. They wear elastic bands that are put in figure-8 around the ankles to prevent their feet from dragging on the ground. Once they start walking, a nurse, family member, or trainer walks behind them with ropes tied to their knees, to lock the knees in stance phase so that the subjects can support their weight while walking. Eventually, some of them don’t need somebody walking behind them and are simply walking with the aid of the rolling cart that provides partial weight support. The whole concept of this vigorous training (6 hours / 6 days / 6 months) is explained as necessary physio treatment after cell or decompretion surgery but there was note that this type of walk & physio also helped a lot to many patients without any cell or surgery treatment. They claim in Kunming Centre to have helped and more than 90% of ASIA C start to walk independently. Finally, here is Dr. Wise’s reply to my question in Cure Forum about connecting someone from hospital in China performing program 6:6:6 to explain some fine tweaks and details related to individual needs where PT with experience in this type of walking can help a lot answering to specific member questions. I have suggested to Dr. Wise to hook-up someone from Kunming Military Hospital with more time and specific knowledge to Exercise & Recovery forum. Please understand that this is work of Dr. Hui Zhu and her colleagues. She recently retired (required due to age) from the Army General Hospital in Kunming and is in the process of moving to a private hospital in Kunming. The details of the training procedure that you are asking have not been published in English. I am not sure that they have been published in Chinese either. Dr. Zhu developed and applied these methods to thousands of patients. Yes, she has videos of individual patients but this is not the same as instructional materials. At ChinaSCINet, we have been doing our best to help them gather the evidence that intensive walking helps restore function and to introduce their method to other doctors. Over the past several years, I have brought many doctors and people from the community to observe. One member of CareCure will be spending time there to help translate and to make it easier for families to visit. We have even brought doctors from Kunming to Rutgers to speak in our Open Houses. At the present, there is nobody in Kunming with sufficient knowledge of English to answer questions of the type that you want to ask. I also want to suggest that this is asking a lot for any group to do and they will be criticized for doing so because their walking procedure is considered experimental. So, please be patient. I think that as soon as Dr. Zhu and her colleagues are settled in the new hospital and restarts her program, they will welcome visitors and perhaps people can help translate and transfer technology. After it’s confirmed from doctors and physio-therapists from some other (more and more) hospitals this Kunming exercise program can be help so many people with Spinal cord Incomplete Injury pointing obvious fact that only certain way to re-wire and retrain Injured Spinal Cord is countless number of repetitions of moves as closest to normal walking as possible. With my Neck – Cervical C-6 Incomplete injury with ASIA C predictions to recovery were on my side but… I had terrible first six months – the most important period after injury – total mistreatment (or no treatment at all) in Lyndhurst Centre in Toronto where they teach you only how to adapt to life in wheelchair. Also I got extra burden of one previous injury with herniated disk between L4 and L5 that was pressing my sciatica nerve down my right leg making my right leg and right lower back spasming beyond control with bending my body and preventing me from gaining control of my walk or even standing. Also there was always lack of enough physio hours or funds to reach next level. 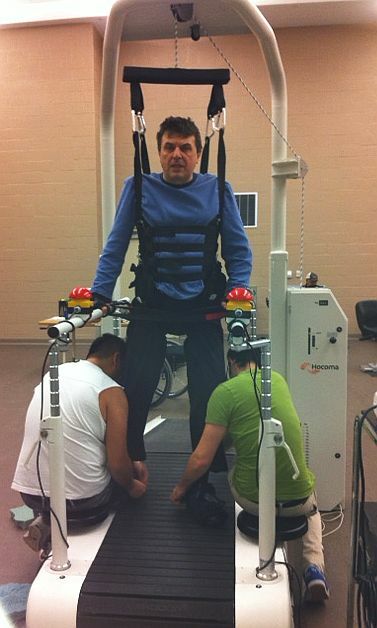 In Canada, with general Health insurance only, (un)officialy, as Chronical Spinal cord Injury, I can get 1 physio treatment per month or 12 per year. That usually get squeezed into 3 month’s once training per week outpatient program from where they kick you out regardless of improvement you show. Last year 2011, I was lucky to join and participate in MacWheelers exercise program. Someone cleverly joined Study of Kinesiology (McMaster University, Hamilton Ontario) volunteer program where students come and help people in wheelchair that can come and exercise as much as they want. There, I am attending 2 gait walk session (30 min each). Even 2 x 30 minutes is not yet close to be enough for any serious improvement I am enjoying great support, fantastic people and I have no time limitation and no-one will dump me out from this exercise program.